A single component, certified, eco-friendly, mineral sealant for water-resistant, high-adhesion sealing, suitable for use with EMICODE® Green Building. It has very low volatile organic compound emissions and is recyclable as an inert material. 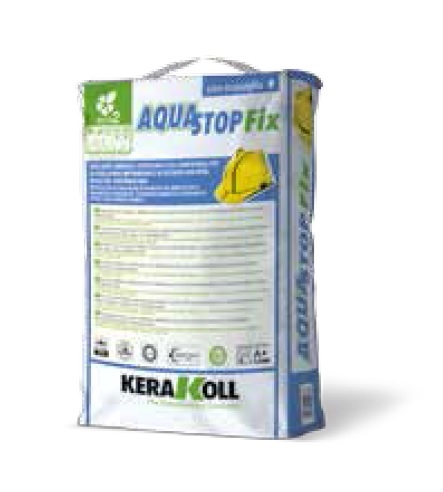 Aquastop Fix develops a fine mixture of extended workability and totally water repellent, guaranteeing the water-resistant adhesion of AquaExpert components and accessories. Guarantees the same adhesion as eco-friendly mineral adhesives. Includes Nanotech technology which makes it completely water repellent and gives high chemical stability. EMICODE® Green Building rating: Eco 2. Tested to BS EN 14891. For the sealing of perimeter joints and between adjacent sheets of Aquastop Green on balconies, terraces and horizontal external surfaces of any size. Apparent volumetric mass: ≈1.35 kg/dm³. Mineralogical nature of inert material: Silicate. Waiting time before laying: Immediate. Interval before normal use: ≈3 days. Water absorption (to BS EN 12808-5): After 30 minutes. 0.10 g; after 240 minutes: 0.18 g.
Water-resistance (to BS EN 14891-A.7): No penetration.